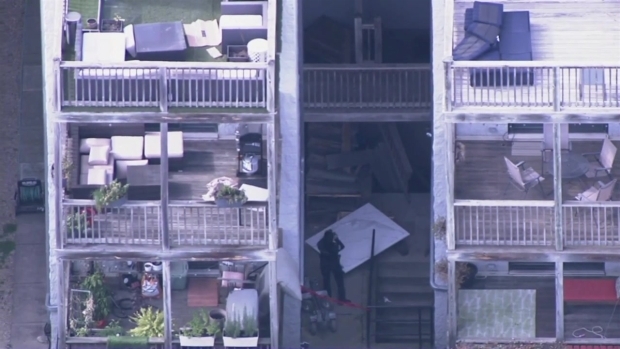 Four construction workers were injured after a stairway collapsed while they were working in Chicago. NBC 5's Chris Hush has the latest details. Four construction workers have been rushed to area hospitals after a stairwell they were working on collapsed in East Ukrainian Village. According to officials, the workers were carrying a slab of granite when the stairwell they were walking on collapsed, sending them tumbling from the structure. Two of the victims were taken to John H. Stroger Jr. Hospital. One worker suffered an injury to his back, and the other suffered injuries to their left foot and ankle. Chicago police investigate scene of construction collapse where four workers were injured. The other victims were taken to Northwestern Memorial Hospital. One victim suffered a head injury as a result of the collapse, and the other suffered injuries to their left arm and leg. The identities and ages of the construction workers have not yet been released. Authorities say they don't believe any of the injuries are life-threatening.